Now that I'm a full-time mom, I'm having an interesting time trying to figure out my identity. This is obviously a topic that's more appropriate for a therapy session than a blog post. But let's just say it's an interesting challenge and I'm rolling with the punches (which, luckily, seem to be few and far between so far). I swear I have a point. As part of this evolving identity situation, I'm excited to take on the role of Good Jewish Housewifey, a major job requirement of which involves baking delicious treats like rugelach. Rugelach are a traditional Jewish pastry made by rolling a dough around a filling, usually some combination of jam, nuts, and/or chocolate. They are insanely good. Next up, I'm going to work on perfecting my favorite challah recipe and get my matzo ball texture down just right. 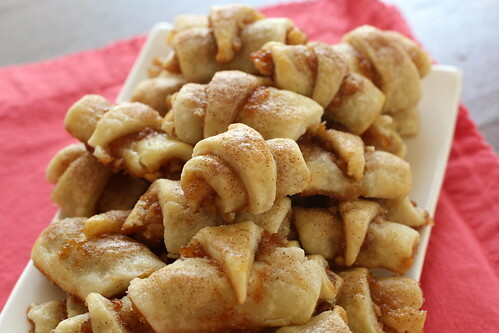 This recipe is from Ina Garten and it was some of the best rugelach I've ever had. The dough has a cream cheese base, and it wound up tasting strongly of cream cheese, which was new to me in this type of cookie. But that tang was welcome and complemented the flavors and textures perfectly. I filled the cookies with homemade apricot jam from a friend (thanks Nicole! ), but you can use any jam you'd like. I also omitted the raisins - it's a personal preference thing! If you omit them, add more walnuts so you have the same volume of filling. 1/4 c. granulated sugar, plus 9 tbsp. 1. Cream the cream cheese and butter in the bowl of an electric mixer with the paddle attachment until light. Add 1/4 cup granulated sugar, salt, and vanilla. With the mixer on low speed, add the flour and mix just until combined. 2. Dump the dough out onto a well-floured surface and roll it into a ball. Cut the ball in quarters, wrap each piece in plastic wrap, and refrigerate one hour. 3. Meanwhile, make the filling. In a small bowl, combine 6 tbsp. of granulated sugar, brown sugar, walnuts, 1/2 tsp. cinnamon, and the raisins if using. 4. On a well-floured surface, roll each ball of dough into a 9-inch circle. Spread the dough with 2 tbsp. apricot preserves and sprinkle with 1/2 cup of filling. Press the filling lightly into the dough. Cut the circle into 12 equal wedges (a pizza cutter works well)-- cutting the whole circle into quarters, then each quarter into thirds. Starting with the wide edge, roll up each wedge. Place the cookies, points tucked under, on a baking sheet lined with parchment paper. Chill for 30 minutes. 5. Preheat oven to 350 F. Brush each cookie with the egg wash. Combine remaining 3 tbsp. granulated sugar and 1 tsp. cinnamon and sprinkle on the cookies. Bake for 15-20 minutes or until lightly brown. Remove to a wire rack and allow to cool completely before serving. In the recent time,when the web is brimmed with online shopping deals, Khaugalideals.com has witnessed its inception with the best Deals in Delhi.While searching for food menus, and restaurant in Delhi,don't forget about Food Voucher, Deals as well as Food Deals because Khaugalideals is your destination for the best deals coupons.Keep on browsing to discover more and more avenues forgreat saving. Get ready to experience thedelight of delicacies with the best food deals in Delhi/NCR,Mumbai. India's leading manufacturers and suppliers of heavy duty racks, heavy duty pallet rack, heavy duty racking and shelving. Contact us for heavy duty racks manufacturer with best quality.